In the sixth pAsuram, AzhwAr says “Oh those who desire for emperumAn! You think about thiruvARanviLai and reach it, to eliminate all your sorrows”. onRu nillA kedum muRRavum thIvinai uLLith thozhumin thoNdIr! kedum – will be destroyed. emperumAn embraced the decorated, very enjoyable, divine shoulders of rukmiNi who is complete in enjoyability, after defeating rukma in the war, on that day when he chased emperumAn. Such great benefactor is always inside me to be praised by my heart without a break even for a moment; you who have the desire to enjoy him, who is mercifully standing in the great city which is well known as beautiful thiruvARanviLai, meditate and worship him; all your sins will be shaken up and be fully destroyed. onRu nillA kedum muRRavum thIvinai – Only when the individual tries to eliminate his sins, it will go slowly like the dirt from a new cloth; but emperumAn who is sarvaSaktha (omnipotent) eliminates them, they will go without a trace. [vishNu dharmam 78th SlOkam is explained] mEru mantharamAthrOpi – the sins which are as heavy as mEru mountain and manthara mountain placed on top of each other; as a disease will be cured certainly when the physician treats it, the sins which were addressed by emperumAn who is said in periyAzhwAr thirumozhi 5.3.6 “maruththuvanAy ninRa mAmaNivaNNan” (emperumAn who is like a doctor, with beautiful gemstone like complexion). He said in SrI bhagavath gIthA 18.66 “sarva pApEbhyO mOkshayishyAmi” (I will free you from all sorrows). It is said in chAndhOgya upanishath 5.24 “sarva pApmAna: pradhUyanthE” (All sins are destroyed). Whatever is said for him applies to his abode as well [Quoted pramANams highlight that emperumAn eliminates the sins. But here it is said that the divine abode itself will eliminate the sins. So, this implies that when AzhwAr talks about the divine abode of emperumAn, it is in context of emperumAn and his full paraphernalia]. uLLith thozhumin thoNdIr – Oh those who are interested in bhagavath vishayam! Think about the abode and reach there. anRu … – He is the one who appears to fulfil the desires of those who desire for anything! anRu – When SiSupAla was actively participating in the svayamvara (rukmiNi’s selection of her groom). angu – He was eager, but rukmiNi was thinking “would the real owner not come and accept me”, he appeared there as he appeared from the pillar [as narasimha]. amar venRu – Accepting arrows in his chest, for her. 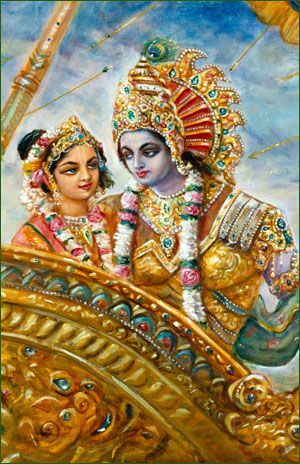 uruppiNi nangai – She was so complete in all qualities, that one would not hesitate to do anything for her. aNi … – One who embraced the most enjoyable shoulders of rukmiNi which were like ornaments for themselves. enRum … – AzhwAr’s heart is fully thinking about the auspicious qualities of rukmiNip pirAtti. The benefactor who is in my heart, to be praised by my heart always in all situations. ninRa … – Oh devotees! worship the great city, the beautiful thiruvARanviLai, where one can see and enjoy emperumAn to remain fearless thinking “he is there for us”, unlike the antharyAmi (indwelling super soul) state where he is shining in the heart yet invisible. If he is yearning to serve emperumAn, why is he instructing others saying “uLLith thozhumin”? For AzhwAr, his own experience will always be mixed with instructions to others; [but can he not just interact with his own heart as said in the first pAsuram of thiruvAimozhi?] there is no difference between his interactions with his heart and his calling out for the devotees. This entry was posted in thiruvAimozhi, thiruvAimozhi 7th centum on November 18, 2018 by Sarathy Thothathri.